Gap down opening is expected with negative bias as it was shared that nifty is stopped by 50 dma yesterday and it was failed to sustain at higher levels . Nifty is trading well below trend line and 20 DMA , yesterday closed in green with low volumes , traders are still in confusion ,other indicators are showing oversold condition .Flat to positive opening is expected with choppy session ahead which may close in indecisive or red closing. 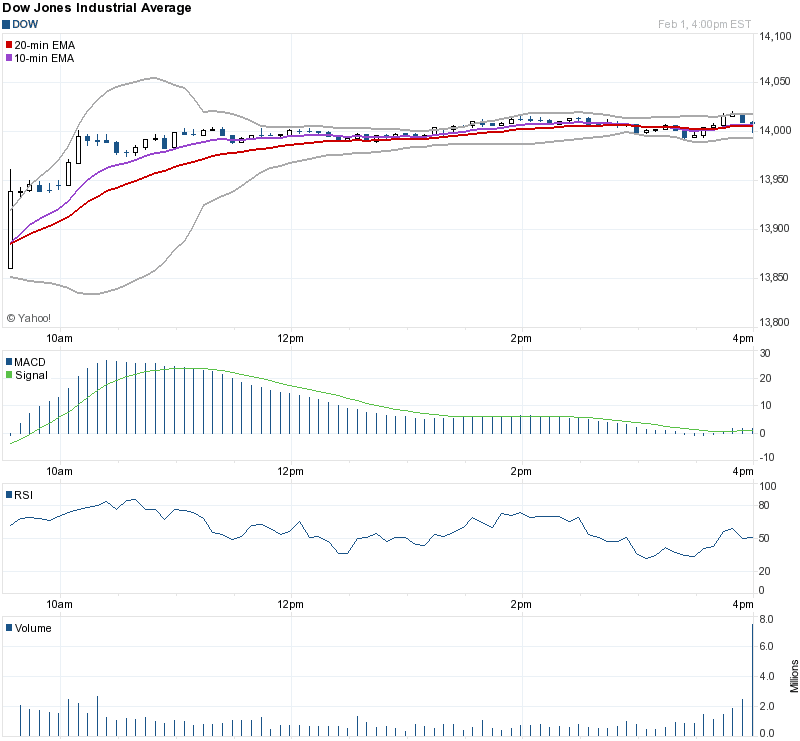 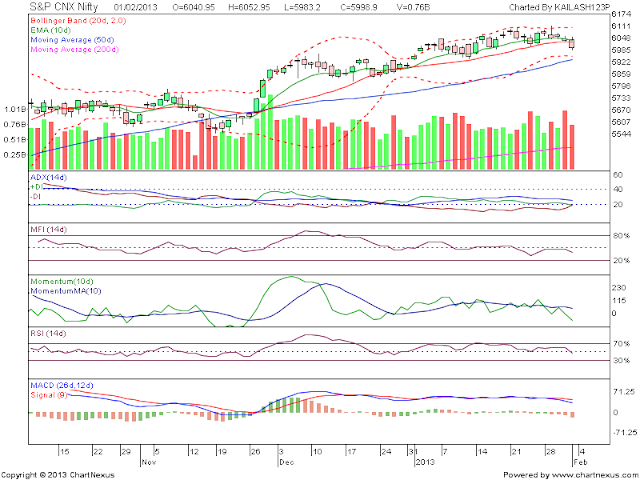 Flat to positive opening is expected with possibility of fresh buying which may turn in short covering rally at later . 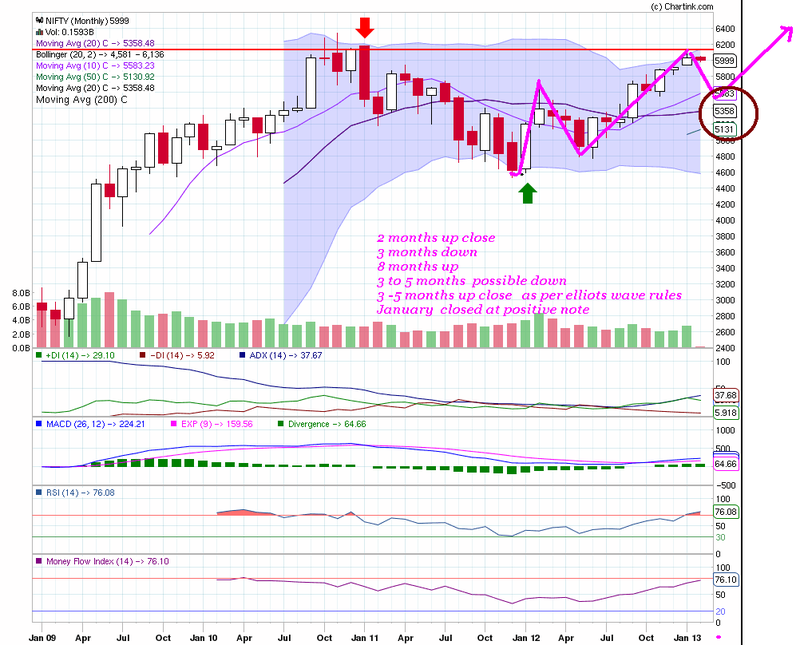 3 years weekly chart is showing spindle bottom above 20 wma but weekly candle closed below lower trend line negative sign and above 20 wma positive signal for for bulls . 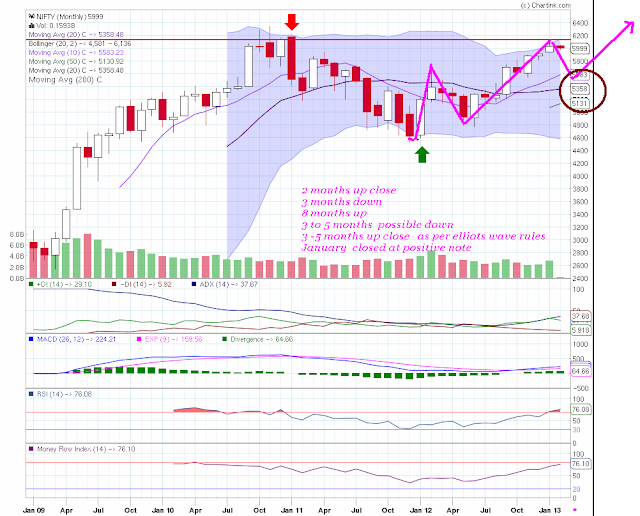 3 years weekly Nifty Chart. 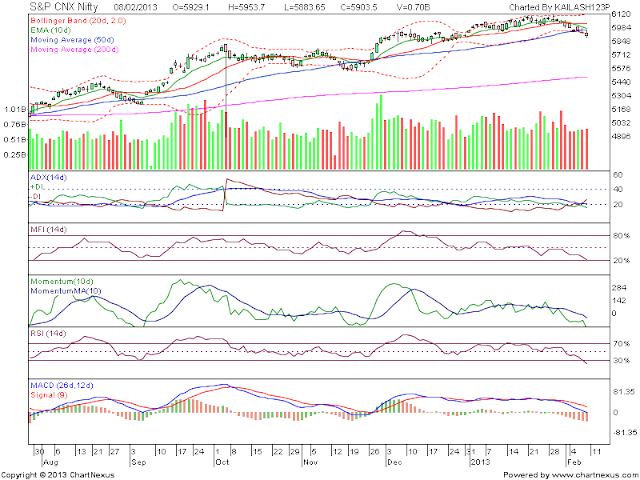 Spot the trend and trade according to trend with stoploss order . 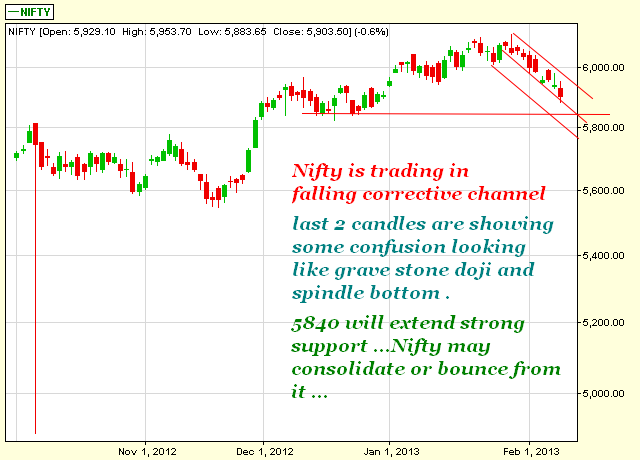 flat to positive opening is expected with possibility of extremely volatile session ahead ...traders are still confused here is it buying time or selling time ....will market go up or down ....so have patience spot intra trend and play accordingly ..
Trade with stoploss orders ..
positional traders are advised to stay short with trailing stoploss at 5965 closing basis . 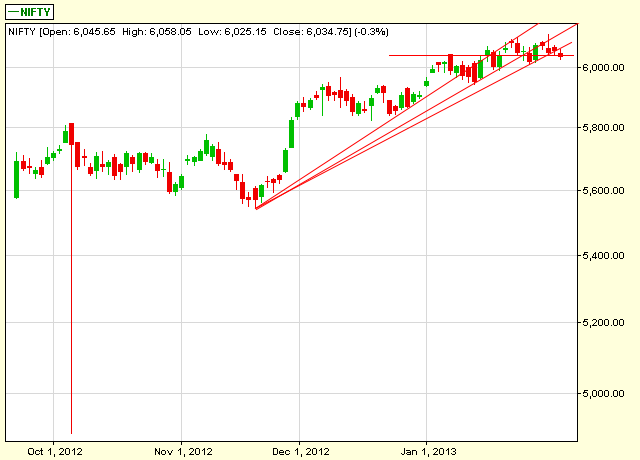 Trade in nifty futures as per these levels . Never trade without stop loss order ..
Never trade on emotions ..
Speculations / gut feeling may or may not always work....so avoid trading on gut feelings or speculations. having nothing to do ..
we will guide you online about placing orders stoploss orders , real time chart reading and prediction of future moves ...thru audio visual means ..
Daily chart is showing that market entered in bearish zone closed below 50 DMA..
kailash123p@yahoo.co.in (2/8/2013 9:22:16 PM): r u booking gains between 5174 to 5164 ??? kailash123p@yahoo.co.in (2/8/2013 1:59:57 PM): 5963 to 5951 have u traded ? 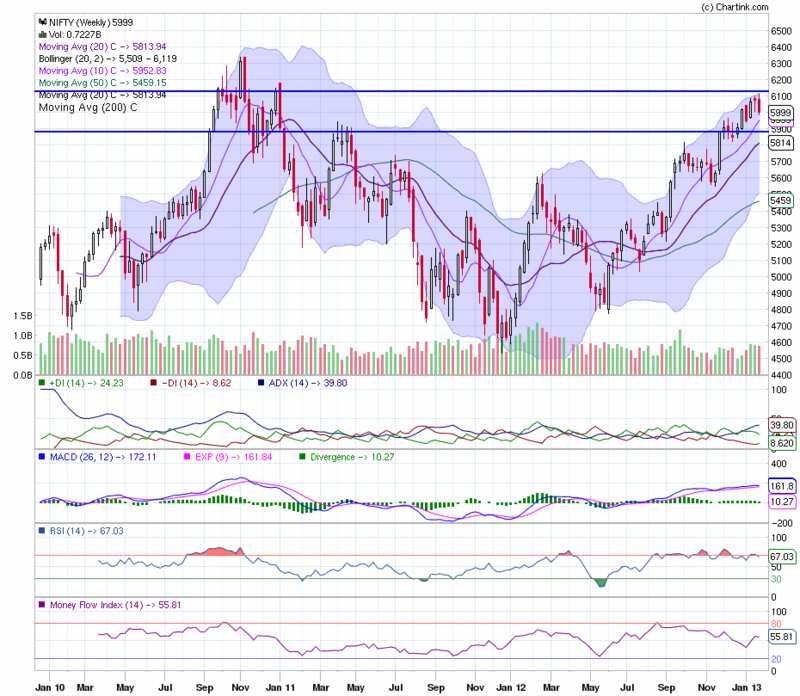 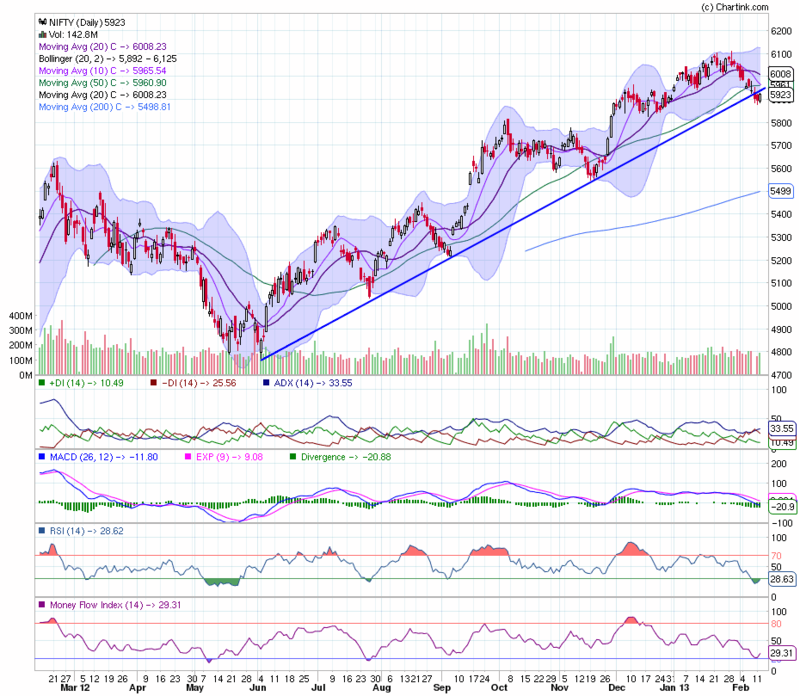 kailash123p@yahoo.co.in (2/7/2013 7:45:27 PM): please update ur positions in crude ? 90 % chances of Nifty spot to enter and stay in new channel 5840- 5940..
Trade according to trend , trade with stop loss punched in and do not trade on emotions..
kailash123p@yahoo.co.in (2/6/2013 7:24:38 PM): sell ng at cmp 184 or below 184.50 sl 184.60 expecting panic sell off tgt 182 180 low risk high reward..
kailash123p@yahoo.co.in (2/4/2013 8:11:55 PM): have u gained 1 point or more on natural gas ? kailash123p@yahoo.co.in (2/4/2013 10:17:07 PM): gas 175.50 to 179 .....dhanvarsha gain 4000/- plus per lot capital margin required 8900/- brokerage only 79 Rs ..
Do Nifty follows Dow ??? Flat to positive opening is expected ,nifty may trade in green zone for few hours but it is expected that it will move to red zone as early as bears will start gathering .As Nifty is trading below 20 day moving average so advised to sell on rise and book profits at low . 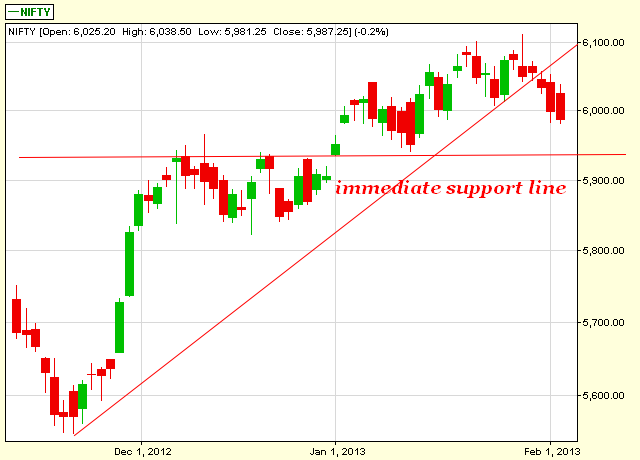 positional traders are advised to stay short with sl of 6102 closing basis . 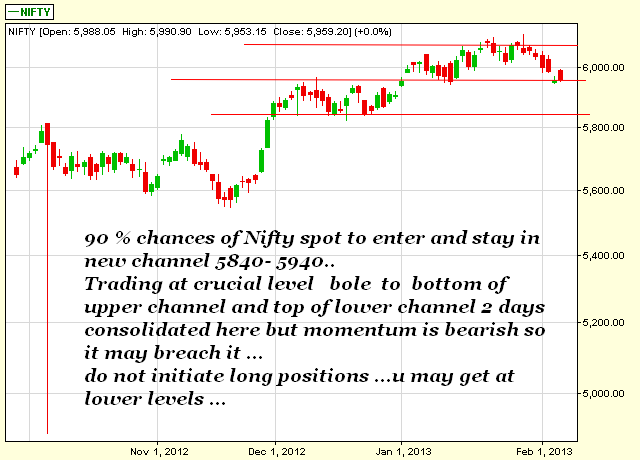 Trade according to trend and use strict stoploss. 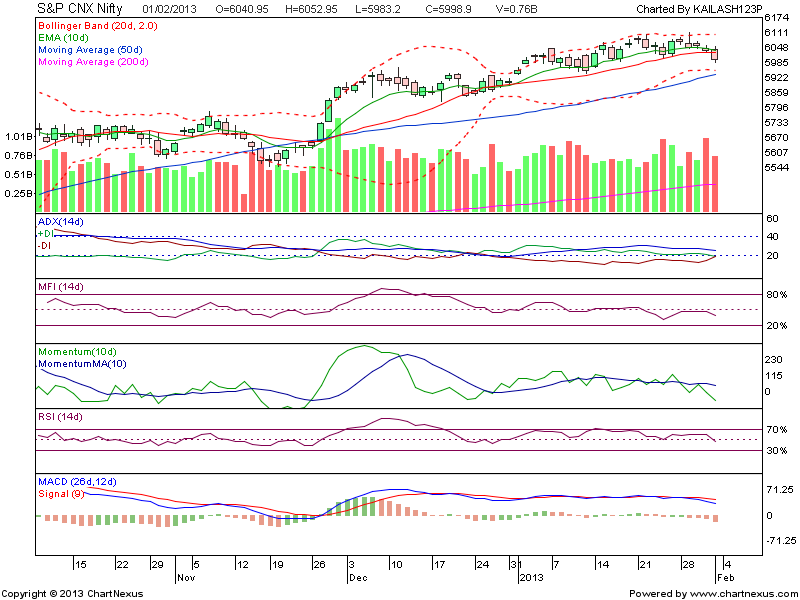 option call advised to buy at 55 56 gained 20% on day 1 ..
are you looking for such calls /support ? 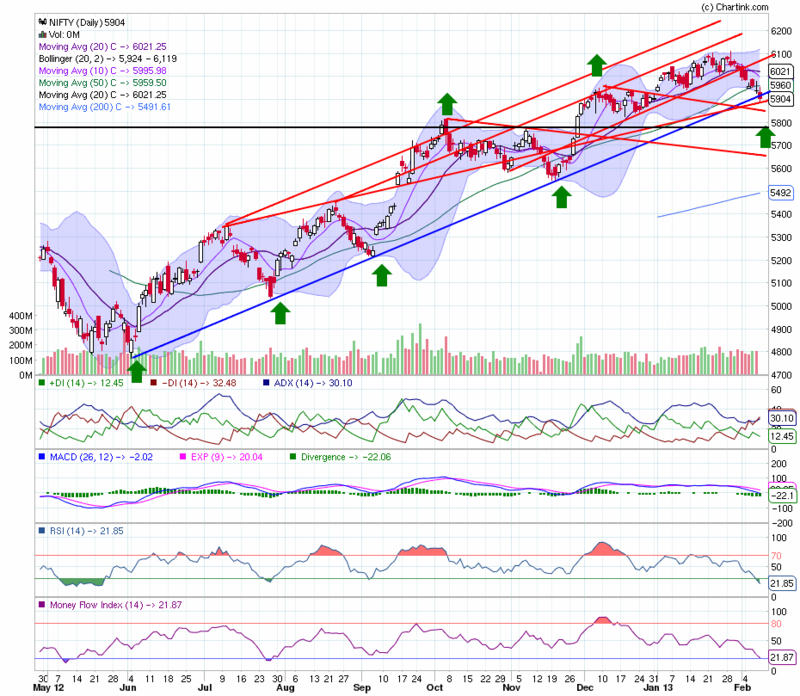 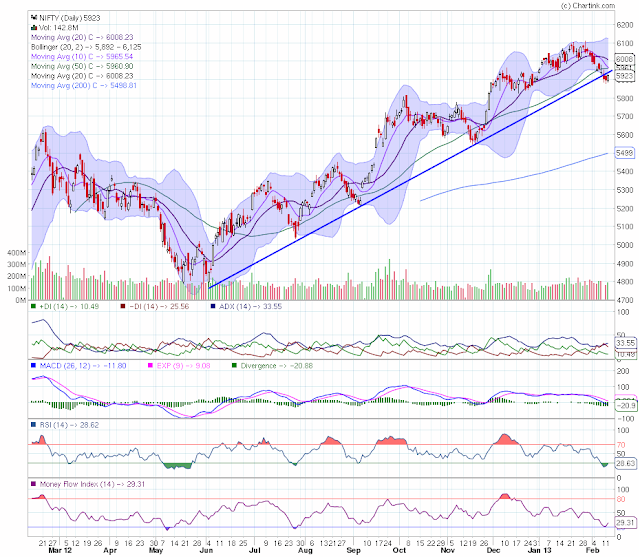 This eod chart is showing that upward momentum is not there ..
do we need more confirmation for retracement ??? ?